Here at Combat Doors, we pride ourselves on two things above everything else; the quality of the products we provide, including Bi-Folding Doors, and the standard of service with which we back up that quality. It’s no accident that the first commercial door we fitted, more than 20 years ago, is still in perfect working order despite being used on a more or less constant basis. Nor is it a coincidence that the vast majority of the clients we cater to come to us on the basis of a personal recommendation. What did customers say about our Bi-folding doors? Of course, you’d expect us to sing our own praises, but a quick glance at the testimonials our satisfied customers have provided for us will demonstrate that our guarantees of quality are simply an honest reflection of the way we do business. No matter whether you’re looking for shutters, windows or an entire shop front, contact us today and we’ll explain exactly what we can do for you and how much it’s going to cost. If, on the other hand, you’re looking for a bespoke solution able to transform your home in a manner which is both stylish and practical, then take a look at some of the best bi-folding doors Manchester has to offer. The first thing you’ll notice about the bi-fold doors we provide is the sheer size of them. The fact that our bi-folding doors fold away quickly and easily away for convenience and access means that we can design and build them to your unique specifications. That often means taking up the virtually the entire wall of a family home with a set of aluminium bi-fold doors able to flood the room with light, whilst also offering stunning views of the environment beyond. The second aspect which means that more and more people are opting for bi-folding doors Manchester, North West and beyond is that they blur the boundary between home and garden, bringing the outside in and expanding the space available for living, working or playing in a dramatic and aesthetically pleasing manner. Our Bi-folding doors used by Starbucks. 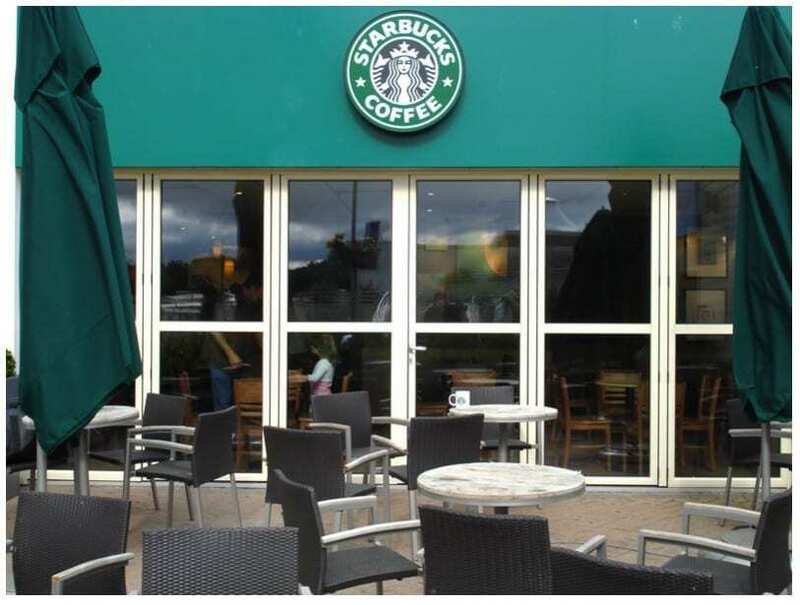 The flexibility offered by bi-folding doors is encapsulated by the efficient manner in which they deal with the differing types of weather which any set of bi-fold doors in Manchester is going to have thrown at it. In winter the doors can be closed and the high-performance thermal glass will keep out the worst that the elements come up with. Come summer, however, you can throw the bi-fold doors open; the fact that they are designed to fold completely flat against each other to one side means they offer complete access to the fresh air and the sunshine outside. Every aspect of the best bi-folding doors Manchester has to offer is designed with the individual customer in mind, from the overall size and shape to the fixtures and fittings, meaning that they blend perfectly with the existing interior designs of your home at the same time as transforming the way in which you enjoy it. If you’re tempted then take a look at exactly what we have to offer. The finest quality bi-fold doors in the North West could soon be yours, and probably for much less than you’d imagine.